A few weeks ago I came across a deal that I couldn't pass up: a factory re-certified Xbox 360 selling for $200. This is $100 off the normal retail price, and I have had pretty good experiences with refurbished hardware. After receiving approval along with "conditions" from my financial adviser (Heather) I ordered the console. I waited anxiously for the console to arrive, refreshing the UPS tracking page at least once an hour for updates on where my new toy was on its shipping adventure. As soon as I picked it up off the doorstep I took it into the living room and connected it to our television. If you are in the know, you will recognize the picture at the top of this post. 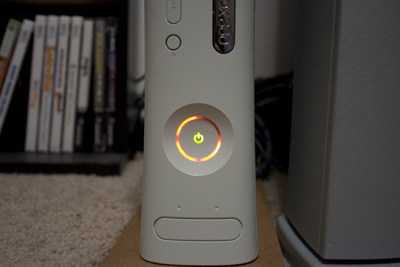 It's known as the "Red Ring of Death" and it means that my Xbox is broken... Fortunately Microsoft is going to fix it for free, but this means that I will be without my console for an indeterminate period of time. It doesn't help that I had the console for less than a week before this problem occurred, but I suppose I would rather the problem happen within the 3yr warranty period that covers this specific issue.